What's new this year? For the first time the festival's screenings are repeated on Sunday to ease visitor congestion which plagued the venue during the last two years. A young Yalanji girl witnesses her sister's suicide. This is the tale of her descent into melancholy and her journey of redemption. A father and his adopted troubled teenage son take a trip to the son's birthplace of Bourke, where they try to find the right words to say to each other before it's too late. Olivia longs to know the people who came before her, in a country filled with mystery and wonder. Her mother Lauren, concerned with what her daughter might discover, is forced to come to terms with her own history and truths. Aunty Maggie and Uncle Peter struggle to feed their three nephews. The arrival of some chickens provides a new food source. eggs! When the new rooster becomes more of a headache and nearly dies, Aunty Maggie's quick thinking shocks the family and makes her famous. When Patsy is confronted by her 10 year old daughter's fascination with letters, she is forced to deal with her own obsession. Gina, a young Aboriginal mother, finds herself in a predicament when her husband Max returns home and learns the truth about baby Jacob. For ten year-old Madeline, it takes more than just dreaming to survive; it takes a friend. Fire Talker uses archival footage spanning forty years, to build a candid portrait of the life and times of Charles Perkins, Aboriginal activist & bureaucrat. Perkins was on the frontline of the emerging Aboriginal rights movement and infamous for his, straightforward thinking and sometimes aggressive temperament which made him friends and foes, both black and white. Warwick has been making films for the last twenty years, beginning at CAAMA in Alice Springs and leading to his debut feature Samson and Delilah. The films in this retrospective present his drama works; distinctive and uncompromising,they weave humour, pain and love with a boldly cinematic style. After twenty years Paddy is released from gaol, but now he must face his own law. When Catherine buys two pieces of Aboriginal art at an auction, she doesn't realise her world is about to be turned upside down. Over one transformative night, radio DJ Kenny realises that his job at an Aboriginal community radio station is about more than just playing music. A senior Aboriginal man reflects on communication the old way. But times have changed and this old man now has a new way! Warwick Thornton calls this two-minute film a 'mobi-doc', a documentary made for mobile phones. Nana's granddaughter thinks Nana's pretty special; because she helps the old people, she's a good painter and other people love her too. Nana's got everyone under control. 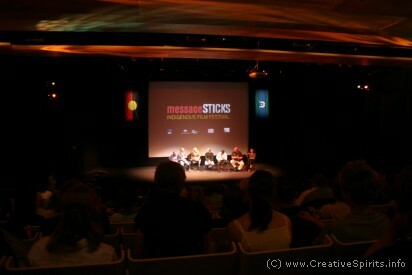 Fresh from Sundance Film Festival, Before Tomorrow opened the prestigious Toronto Film Festival and now has its Australian Premiere at Message Sticks. It is the year 1840, and some Inuit tribes have never had contact with white people. Ningiuq, an old Inuit woman of strength and wisdom, cannot stop worrying as she sees the world around her as fragile. Audiences will be invited to experience a sneak preview of a work in progress of Richard Frankland's highly anticipated new feature. What happens when two Blackfellas drive a few thousand kilometres in search of a sacred stone in a beat up station wagon with 187 pre-rolled joints and a bottle of chocolate sauce for company? Frankie is dying. Irene hasn't forgiven him. And they are racing against time to find their way home. Frankie needs help and Irene is the one he turns to. He must go home one last time. The two set out on a journey that becomes more than getting home, it's also about confronting the past, love, understanding, and self discovery. Indigenous filmmakers pitch their best story ideas to ABC TV executives in a lively open competition for television deals. Hear our storytellers share their ideas for the future.